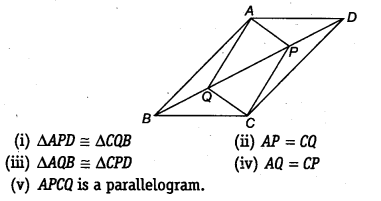 NCERT Solutions for Class 9 Maths Chapter 8 Quadrilaterals Ex 8.1 are part of NCERT Solutions for Class 9 Maths. Here we have given NCERT Solutions for Class 9 Maths Chapter 8 Quadrilaterals Ex 8.1. The angles of quadrilateral are in the ratio 3 : 5 : 9 : 13. Find all the angles of the quadrilateral. Let the angles of the quadrilateral be 3x, 5x, 9x and 13x. ⇒ The required angles of the quadrilateral are 36°, 60°, 108° and 156°. Let ABCD is a parallelogram such that AC = BD. i.e., ABCD is a parallelogram having an angle equal to 90°. ∴ ABCD is a rectangle. Let ABCD be a quadrilateral such that the diagonals AC and BD bisect each other at right angles at O. Thus, the quadrilateral ABCD is a rhombus. Alternatively : ABCD can be proved first a parallelogram then proving one pair of adjacent sides equal will result in rhombus. Let ABCD be a square such that its diagonals AC and BD intersect at O. (i) To prove that the diagonals are equal, we need to prove AC = BD. ∵ ∠AOB and ∠AOD form a linear pair. From (1), (2) and (4), we get AC and BD are equal and bisect each other at right angles. Let ABCD be a quadrilateral such that diagonals AC and BD are equal and bisect each other at right angles. 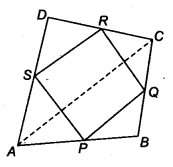 ∴ Quadrilateral ABCD have all sides equal. But, they form a pair of alternate interior angles. ∴ ABCD is a parallelogram. ∴ Parallelogram having all its sides equal is a rhombus. Since, AD || BC and AB is a transversal. So, rhombus ABCD is having one angle equal to 90°. (i) Since, ABCD is a parallelogram. ∴ AB || DC and AC is a transversal. Also, BC || AD and AC is a transversal. ABCD is a rhombus. Show that diagonal AC bisects ∠Aas well as ∠C and diagonal BD bisects ∠B as well AS ∠D. Since, ABCD is a rhombus. Also, AD || BC and AC is the transversal. Since, AB || DC and AC is transversal. ∴ AC bisects ∠C as well as ∠A. Similarly, we can prove that BD bisects ∠B as well as ∠D. We have a rectangle ABCD such that AC bisects ∠A as well as ∠C. (i) Since, every rectangle is a parallelogram. ⇒ AB || CD and AC is a transversal. So, ABCD is a rectangle having adjacent sides equal. ⇒ ABCD is a square. (ii) Since, ABCD is a square and diagonals of a square bisect the opposite angles. So, BD bisects ∠B as well as ∠D. (i) Since, AD || BC and BD is a transversal. (iii) Since, AB || CD and BD is a transversal. ∴ ∆PCQ is a parallelogram. In ∆ABC and ∆DEF, AB = DE, AB || DE, BC – EF and BC || EF. Vertices A, B and C are joined to vertices D, E and F, respectively (see figure). i. e., ABED is a quadrilateral in which a pair of opposite sides (AB and DE) are parallel and of equal length. ∴ ABED is a parallelogram. i.e. BEFC is a quadrilateral in which a pair of opposite sides (BC and EF) are parallel and of equal length. ∴ BEFC is a parallelogram. i.e., In quadrilateral ACFD, one pair of opposite sides (AD and CF) are parallel and of equal length. ∴Quadrilateral ACFD is a parallelogram. [Hint: Extend AB and draw a line through C parallel to DA intersecting AB produced at E]. We have given a trapezium ABCD in which AB || CD and AD = BC. ∴ AECD is a parallelogram. (ii) AB || CD and AD is a transversal. ∴ S is the mid-point of AD and R is the mid-point of CD. (ii) In ∆ABC, P is the mid-point of AB and Q is the mid-point of BC. ∴ PQRS is a parallelogram. ABCD is a rhombus and P, Q, R and S are the mid-points of the sides AB, BC, CD and DA, respectively. Show that the quadrilateral PQRS is a rectangle. We have a rhombus ABCD and P, Q, R and S are the mid-points of the sides AB, BC, CD and DA respectively. Join AC. In ∆ABC, P and Q are the mid-points of AB and BC respectively. In ∆ADC, R and S are the mid-points of CD and DA respectively. ∴ One angle of parallelogram PQRS is 90°. ABCD is a rectangle and P, Q, R ans S are mid-points of the sides AB, BC, CD and DA, respectively. Show that the quadrilateral PQRS is a rhombus. So, PQ = QR = RS = SP i.e., PQRS is a parallelogram having all of its sides equal. Hence, PQRS is a rhombus. ABCD is a trapezium in which AB || DC, BD is a diagonal and E is the mid-point of AD. A line is drawn through E parallel to AB intersecting BC at F (see figure). Show that F is the mid-point of BC. Using the converse of mid-point theorem, we get, G is the mid-point of BD. Again in ABDC, we have G is the midpoint of BD and GF || DC. Using the converse of the mid-point theorem, we get, F is the mid-point of BC. 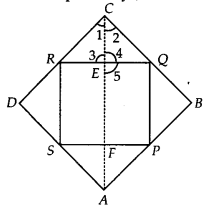 In a parallelogram ABCD, E and F are the mid-points of sides AB and CD respectively (see figure). Show that the line segments AF and EC trisect the diagonal BD. Since, the opposite sides of a parallelogram are parallel and equal. ∴ ∆ECF is a parallelogram. So, the line segments AF and EC trisect the diagonal BD. Let ABCD be a quadrilateral, where P, Q, R and S are the mid-points of the sides AB, BC, CD and DA respectively. Join PQ, QR, RS and SP. Let us also join PR, SQ and AC. Now, in ∆ABC, we have P and Q are the mid-points of its sides AB and BC respectively. And the diagonals of a parallelogram bisect each other, i.e., PR and SQ bisect each other. Thus, the line segments joining the midpoints of opposite sides of a quadrilateral ABCD bisect each other. D is the mid-point of AC. (ii) Since, MD || BC and AC is a transversal. We hope the NCERT Solutions for Class 9 Maths Chapter 8 Quadrilaterals Ex 8.1 help you. If you have any query regarding NCERT Solutions for Class 9 Maths Chapter 8 Quadrilaterals Ex 8.1, drop a comment below and we will get back to you at the earliest.